Grandmother Flordemayo shares her vision & prayer. 1. 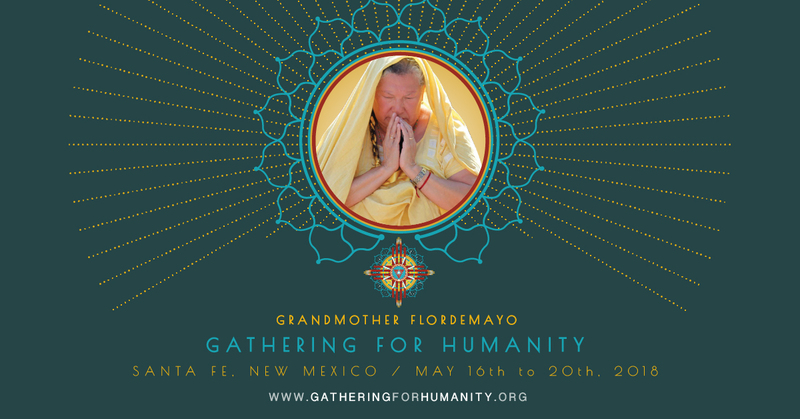 Why is participating in the Gathering for Humanity important ? It is important because we as elders, as grandmothers and grandfathers have a responsibility to the youth and while we are physically on the planet we have to leave information for the future generations. WE are doing our work right now as grandmothers and grandfathers because our elders took the time when we were young to embrace us and to teach us to remind us that one day we would be the elders. We made that commitment some time ago. 2. Why is now such a pivotal time on Earth ? For generations our ancestors have been reminding us to walk in balance, being conscious of our daily life as we live with the consciousness of the four sacred elements. Taking care and being responsible for our sacred mother earth, taking care of the sacred air, our sacred water, and to always be conscious of the spirit of the sun. The sun that helps for everything to grow on the earth. We as humans have a responsibility to always walk in balance with every step that we take to be gentle to our mother earth. 3. What will people experience at the Gathering? They will experience the beauty of the Great Mystery. We are being asked to collectively come together to form an embodiment of light. Where we can extend our hands while standing on the earth and asking the holy ones to bless us. They have asked us to come together. We will receive that blessing. Many of us will experience it in many different ways because we are all different and yet we will be in the energy together of the great mystery. 4. What is the Star Nations relationship with humanity at this time? I believe in my heart, I am speaking as Flordemayo, a woman from the center, we are taught in our teachings of creation that we the Maya Nation, before we were brought to Central America, that our birth place was the Palaides. So I stand here before you as a child of the stars, a Paladian. 5. Why is the power of prayer of important? Because this is all that we have; there is nothing but prayer and prayers do work. 6. Why is the power of ceremony important? Because it humbles us with every moment that we dialogue with the creator. 7. Is now a tipping point for collective human consciousness? Yes we have been in the midst of crossroads since the mid 1980’s a period called the harmonic conversions. 8. What prophecies have been shared with you that align with what is happening today? We were told by our elders that in the mid 80’s the planets were going to align and that this period was going to awaken humanity and humanity was going to accelerate into a different state of consciousness and so many people became spiritually awakened.